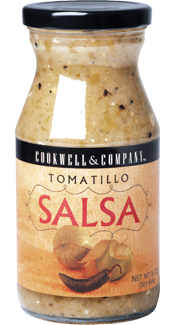 Happy weekend, friends...I'm sorry I didn't get by here yesterday as promised to share all of the exciting details about the salsa-themed recipe contest I'm hosting in conjunction with Cookwell & Company. Our computer is currently at The Apple Store having some new RAM installed, so I've only had my iTouch to access the internet the past two days, and that wasn't working out so well for blog posting! Luckily, I have access to a computer this morning...so I'm here to share all the details about the Spicin' It Up With Cookwell & Company Recipe Contest! Cookwell & Company is a gourmet food company based right up the road from me in Austin, Texas. They offer a wide range of delicious ready-to-use food products, including salad dressings, gumbo and chili starters, queso, BBQ sauces, and marinades to name a few. They also offer some really delicious salsas, and they want one of YOU to come up with a winning recipe that showcases one of two salsas: Escabeche-Style Salsa OR Tomatillo Salsa. The Escabeche-Style Salsa has a complex flavor profile. It starts with a spicy mix of lime juice, onions, jalapeños, and carrots. The chiles are roasted to bring out their full flavor, and a bit of fresh cilantro and lemon juice is added as well. I really enjoyed this salsa...it's spicy, but not overly so. The carrot and lime give it a different flavor from other salsas I've tried. This is a smooth salsa that goes equally well with tortilla chips or as a recipe ingredient! This salsa is very versatile...I used my jar to make a wonderful spicy ranch dressing for a main dish dinner salad, and I also added a cup of it to a pot of rice for a simple and tasty Mexican Rice! The Tomatillo Salsa has a completely different flavor profile from the Escabeche-Style Salsa, and it's also delicious. This salsa combines fire-roasted tomatillos, along with cilantro and Hatch green chiles. This salsa is quite tangy thanks to the tomatillos and lime juice. It has a nice bit of heat, but it's not in-your-face spicy! The best way for me to describe the flavor of this salsa is...fresh! It paired very nicely with tortilla chips during the Casa Garcia salsa taste test, and I also enjoyed it drizzled on top of a pan-seared chicken breast. 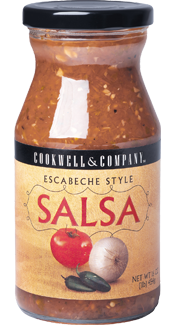 Readers will create an original recipe using Cookwell & Company's Escabeche-Style OR Tomatillo salsas. E-mail your recipe to me, preferably with a picture of the finished product, between August 13th and August 27th. If you're a food blogger, you can feature the recipe on your blog and submit a link to the post via e-mail instead. My e-mail is: wendyweekendgourmet@gmail.com. I'll forward all entries to Cookwell & Company for judging by August 28th. The winner will be announced the first week of September. Finally, the winning recipe will be featured in the Recipes section of the Cookwell & Company website in conjunction with either the Super Bowl or March Madness in 2012. So...that's the scoop, folks! I have some very creative cooks who regularly read this blog, so I can't WAIT to see what fun recipes you come up with...if you have any questions, feel free to drop me an e-mail or ask in the Comments below. I'm honored and excited to partner with Cookwell & Company for the Spicin' It Up With Cookwell & Company Recipe Contest in conjuction with The Weekend Gourmet's month-long blogiversary celebration! !